The cocktail scene in Calgary is next-level. There’s a plethora of talented bartenders here that have made cocktail-making an art form, so going out for ‘a drink’ can often turn into a mini-tasting of the entire cocktail menu. With a huge selection of signature concoctions from bars and restaurants in every corner of the city, it can be tough to choose where to head for a little hair of the dog. 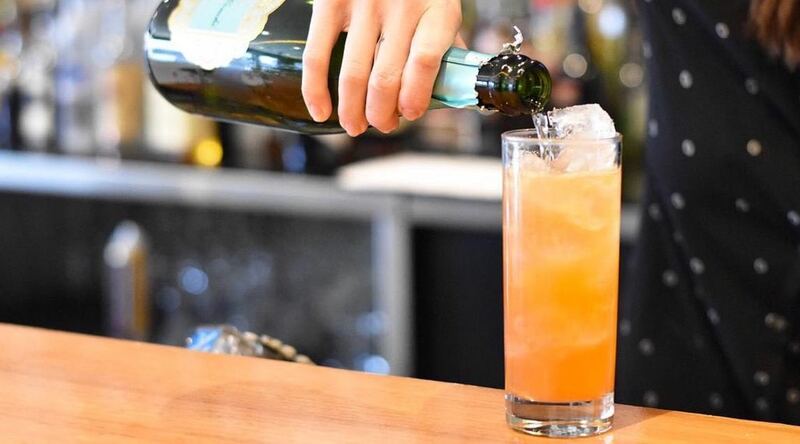 We’ve attempted to make this predicament a little easier for you by choosing 9 of the most tantalizing must-try cocktails in YYC. This cocktail is one of six adult slurpees on National cocktail list. A blend of gin, lavender, and honey – you get 2oz of liquor and a whole lot of flavour. Modelled after the time when the speakeasy was thriving, Cannibale’s cocktail menu is divided into Pre Prohibition, Post Prohibition & Tiki, and Revival sections, along with an Original list as well. We’d recommend the classic New York Sour from the Pre Prohibition list, a mix of Evan Williams Black Label Bourbon, lemon, sugar, egg white, and red wine. Since Caesars were invented in Calgary back in 1969, it’s only fitting there are many establishments that make this signature spicy cocktail very well. One that stands out is the Shin Ramen Caesar from ANJU. This drink is known for its unique Eastern-spice flavour from the combination of Jamenson’s Irish Whiskey, spiced cilantro, and lime, along with its unique ramen noodle garnish. Bar C is known for having an incredible ever-changing menu of seasonal cocktails. The Jack Spritz has got to be one of the best recent additions: a perfect mixture of Jack Daniel’s Honey, Aperol, ginger syrup, and finished with Cava in a tall glass. The cucumber cilantro margarita from Añejo is made with Blanco tequila, triple sec, mango pulp, agave, and lime. This is one of 10 margarita flavours, so don’t plan anything too soon after having drinks here. Klein/Harris has an impressive cocktail list full of innovative flavours. Their twist on the classic old fashioned is one of our favourites: stirred up raw sugar cube, Fee Brother Walnut Bitters, George Dickel Tennessee Sour Mash, and a dash of Messias Porto 10-year served on the rocks. For those who love cocktails and also have a sweet tooth, The Black Manhattan is the perfect thing to sip on. Forty Creek Whisky, Averna Amaro, and finished with chocolate bitters – this cocktail is undoubtedly a must try. The cocktail menu at Milk Tiger is insane in the best sense. With dozens (seriously, dozens) of cocktails on the menu it’s tricky to choose just one, but if you focus on Tiger’s ‘Cities and Bouroughs’ section of sippers, the Toronto stands out. Alberta Premium Rye Wiskey, Fernet Branca, simple syrup, and Angostura bitters make up this drink. Proof Cocktail Bar’s menu is a masterpiece mostly because of the amazing selection of beverages, but also because of the art included on the pages. Try The Beltline named after one of the city’s most historic neighbourhoods. This drink is made up of Auchentoshan Three Wood Scotch Whisky, Pineau des Charentes, Cocchi Vermouth di Torino, Angostura, and orange bitters.